Convicted of treason despite their heroic defense against Napoleon’s invasion of England, Temeraire and Capt. Will Laurence have been transported to a prison colony in distant Australia—and into a hornet’s nest of fresh complications. The colony is in turmoil after the overthrow of military governor William Bligh—aka Captain Bligh, late of HMS Bounty. And when Bligh tries to enlist them in his bid to regain office, the dragon and his captain are caught in the middle of a political power struggle. Their only chance to escape the fray is accepting a mission to blaze a route through the forbidding Blue Mountains and into the interior of Australia. But the theft of a precious dragon egg turns their expedition into a desperate recovery operation—leading to a shocking discovery and a dangerous new complication in the global war between Britain and Napoleon. I was really excited to begin this book to see a glimpse of Australia, but the Australia of this time period is, frankly, miserable and messy. There's not much food or resources to be had, and not many good men to work since Australia was used as a penal colony. There has also been a coup for power, known as the Rum Rebellion of 1810, and two rival military groups are trying to gain control, thus trying to also influence their new Aerial Corps members to their side. 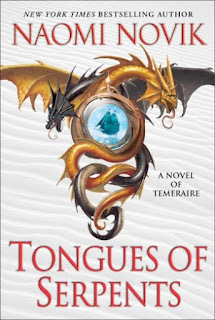 Temeraire and Laurence have been accompanied by Iskierka (of her own will, naturally) and Granby and three dragon eggs, intended to found the colony's only dragons and airmen. One of the potential captains for the eggs is Rankin, who was in His Majesty's Dragon and ill-treated his old dragon to death. The first egg to hatch is that of the ferals and arrogant Caesar emerges, choosing Rankin on account of his family's status and wealth despite Temeraire's best efforts to convince him of Rankin's villany. Thus, when the temporary commander of the colony orders Laurence to make a pass to Sydney from the nearby mountains, Rankin, Caesar, and the two eggs accompany them along with men to dig and Iskierka and Granby. This task, and the underlying one of catching smugglers, leads them on a chase across all of Australia, especially when one of the eggs is stolen. I found this book to be a bit more of slog than the rest of them since they kept traveling constantly and running out of food, sinking into danger, and generally finding bad luck every which way, not to mention the quarrelsomeness of their company. It felt like the Oregon Trail where people are dying of dysentery left and right and treacherous mountain passes and little food mean possible cannibalism. Not that there was cannibalism exactly. It's just there was more chaos in command for both Temeraire and Laurence and despite their experience and talents, they just fell short. Add this to the fact that they're being gagged by the British government and reports of the war are getting steadily worse, and you feel downright depressed at the lack of action or progress. Another factor in this book is relations with China again and the idea of more conflict between governments over trade. Temeraire and Laurence have to discuss political bribery, which is a moral gray area for Temeraire and largely unknown to him. This dilemma was perhaps one of the most interesting details since heretofore Temeraire usually chooses the moral high ground. Other fun parts are the surprise of Demane, which I won't spoil, and the intrigue of the tiniest dragon egg. After finishing this one, I'm ready to get out of Australia and back to Temeraire and Laurence being regarded as heroes. Onward to Brazil and hopefully some good news! Kara is a teen librarian living in the southeastern US with her husband (who listens to books), young daughter (who sleeps with books), and dog (who tastes the books). She loves all sorts of books, but mostly YA, and will never catch up to all of the wonderful things to read. To write a great argumentative essays the Australian students search essay writing help, Even if you want to get HD grades meet professional Essay Writers to helped in your essay assessment. Our goal is to provide professional essay writing tips and provide services how to write an essay in a HG manners for Australian and international students. Get our help now to get your essays written by university assignment help experts!